Unusual balance deduction is the biggest problem for all of us, as it makes our mobile bill heavier on our pocket. This is a very common problem for us and there are various reasons for the same. An exactly same problem occurs when we are surfing the internet and suddenly our Internet pack gets over but we forgets to turn off data connection in our phone or pc and this little mistake cost us a lot from our mobile balance. Mostly it executes all the main balance we have and if we have balance in hundreds our thousands then it becomes a big pain. However, as per TRAI regulations, there is a way to stop internet usage once you have crossed your data usage limits or you plan is expired. This facility will not allow you to access the internet from your main balance if you don’t have any data pack. If you follow below process then you don’t have to complain every day for that balance deduction. But, most of us don’t know how we can do it and in lack of information we end up paying huge from main balance for internet usage and even if we try to reach customer care, we can’t get our money back as we have received benefits of it and it is non-refundable. Sadly, customer care executive plays smartly with us and ends the call without letting us know that how we can be safe from this in future. However, I agree that we don’t ask about it as we think that there is no such way. According to me, it is the responsibility of customer care to make the customer aware of this but mostly all they do is that they give you a suggestion of keeping check of your data usage and pack expiry so you don’t have to face it in future. But if we think, checking data usage every minute is not a good and easy thing to do if we look at it practically. So today we will tell you how you can do it automatically. The process which we have mentioned below is same for all operators and works flawlessly and comes very handy for us. 1.1 How To Stop This Service? Step 4. 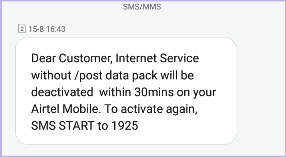 Send it to 1925 with sim you use for internet access. Step 5. The service will be activated shortly and you will also receive a confirmation message for the same. That’s all you have to do. Now if you don’t have data pack and turned on data services mistakenly then there is no problem as you not going to charged for it. As i did you should also send a message from both of your sim cards as it will make both of them safe from sudden balance deduction. Let me make one thing clear the process i mentioned works well for all operators. No matter which operator’s sim card you use it will work for you. 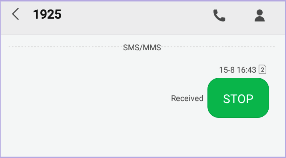 This is because this service is not started by any of operator from vodafone, idea, airtel or any other this is service introduced by TRAI which is regulation authority of all mobile operators. TRAI should make it activated for all by default and those who likes to pay from the main balance or have some need for it should be able to opt out from if they want. How To Stop This Service? If you have activated this service and want to disable it then you can follow below process for the same. But i don’t recommend for you and it’s not useful for most of us, still we have provided process for those who needs this. Your service will be activated within 30 minutes and you will be informed through sms. Once you activate this service there will be not data deduction in feature for the same. But if you deactivate this service then you can continue internet access using main balance and you will be charged heavily by your mobile service operator.